Friday afternoons we have tea. For the last bit of nap time the big kids set up for a tea party using the good tea things. It is a fun time, and a way to make sure my nice things are used and enjoyed! 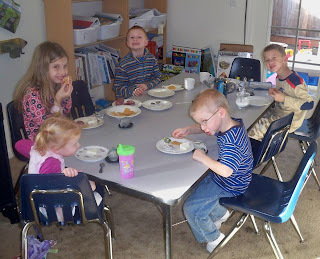 The kids work on their good manners and handling the dishes carefully and they usually hand wash the dishes after tea. We try to have special goodies in the house for these days. Today was cheese, crackers, salami (favorites of Miss E's) and P. B. cookies. We often have some sort of pound cake, muffin or scone. 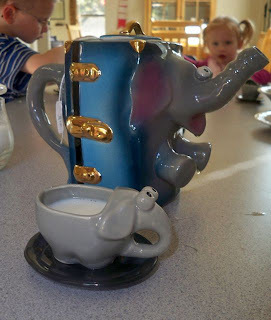 Today instead of the china tea sets we got out the "elephant trunk" tea set. This one is fun to use with the kids, and the boys like it a bit better than all of the flowery tea things.